Hello there everyone! 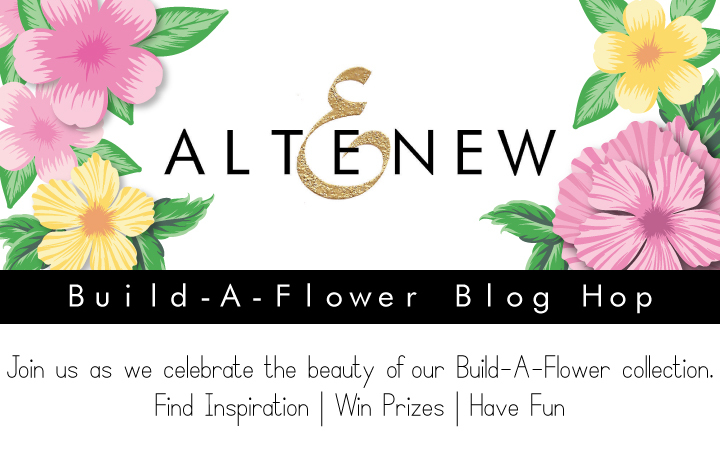 And welcome to our very first Build-A-Flower Blog Hop! Can you believe that we have been bringing you this special release for a year now? To start things off, I thought it would be great to recap what Build-A-Flower Sets we have brought to you this past year. Just look at that floral spectacle! And we haven’t finished there! We have lots more in the pipeline and we are so excited to share them with you. Some of the sets have even been inspired by requests we have had from you. We have so much inspiration to share from our design team and special guests. We can’t wait to share it with you, so let’s get this show started! I thought it would be nice to start with the set that started it all, Build-A-Flower: Camellia. I started by stamping the second layer of the camellia flower in Forest Glades. I then masked this off and stamped two more of the same image this time using Frayed Leaf ink. I then stamped the leaves only using two of the layers using the same inks I used for the flowers. I just love how the monochromatic color combo looks. I then used the Bold Numerals Die Set and cut a three and a five out of some Forest Glades cardstock with some gold glitter washi tape at the bottom. Once die-cut, I added the number die cuts into place using foam tape. 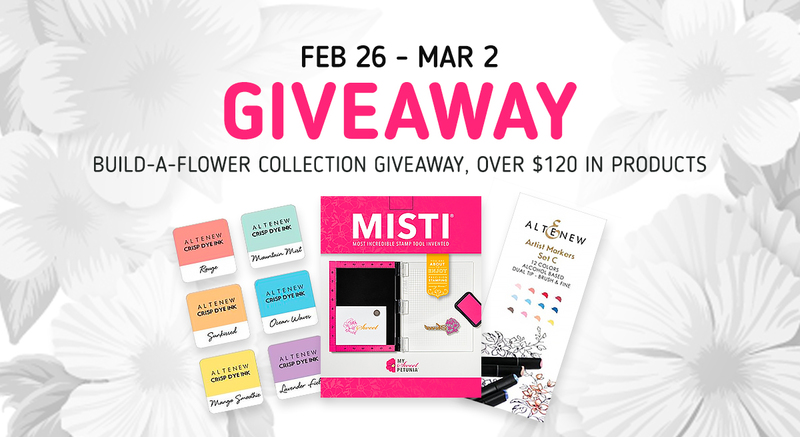 Also, if you place an order from the Build-A-Flower Collection from 2/26/2018 until 3/2/2018, you will automatically be entered into a raffle for a chance to win a big prize! Easy Watercolor Stamping using Frosted Garden + Video! I love the build a flower sets!! Lydia, Your monochrome card is gorgeous!! I am on holiday now but I am still checking on Altenew websites everyday. Can’t wait to start the hop now…. Im very new to stamping, a gift card would be wonderful! I would use it to purchase a build a flower set. Altenew botanical stamps are the best especially the roses. I really like the build a flower range, they bring flowers to life in such a simple way and are so fun. I love your build a flower sets. Gorgeous card. Oh no! The build a rose stamp and die set are sold out! Please tell me you will be getting it again! Thank you for the ideas. I would not have chosen green as a flower base, but you’ve made it look beautiful! Thanks for the opportunity to win. Lovely card. Never thought green would be that pretty for flowers!! Oh these look sooo fun! I can’t wait for a chance to play!!! So beautiful stamp sets, especially Build-A-Flower: Coral Charm and the Rose one. Thanks for the chance to win. 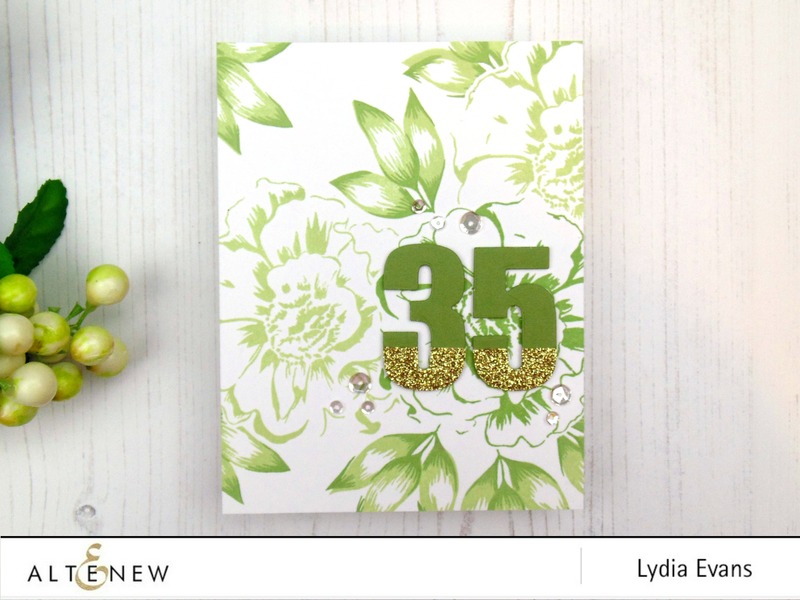 Love the flower set bundles plus all of the inspiration you give us with your sample cards. Gorgeous! 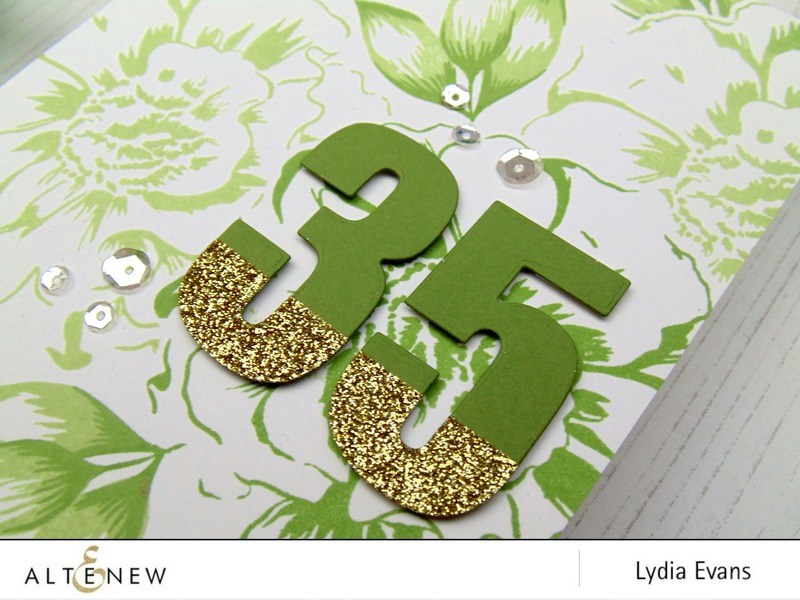 I love how you did the background and the numerals are simply spectacular with the glitter on them! TFS! Loving the monochromatic card and the gold sparkle! Fantastic hop! 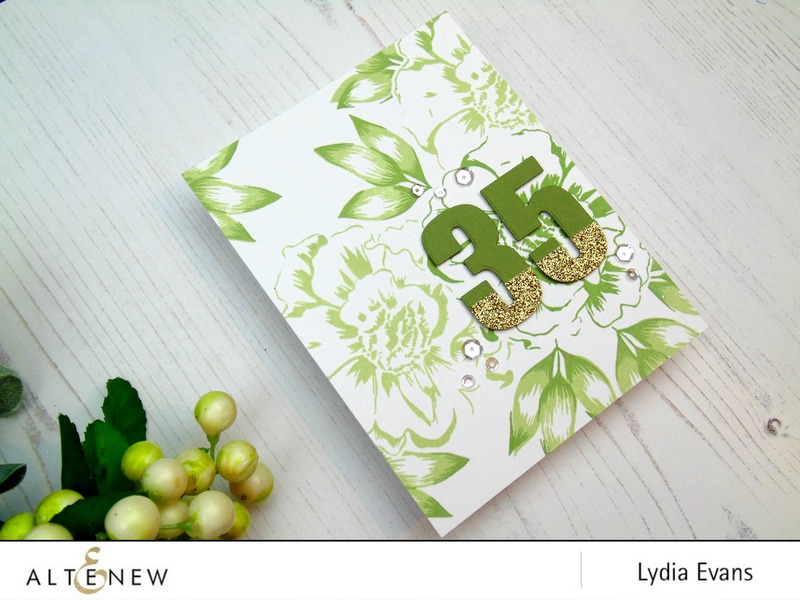 I would never have thought to do a floral card in all green, but it is STUNNING! LOVE the touch of glitter, too!! I love crafting and honestly I really have no idea what stamping was until I came across the altenew website and now I find myself adding build-a-flower sets in my wishlist and my cart as well. I can’t wait to check out my first order. Horray! I love the monochromatic been with the touch of gold! All these flowers are so intricate and beautiful! Love the different ideas. Sooo excited I found the Altenew website and can‘t wait you receive and play with the Iris stamps. These flowers are so awesome. I discovered them just a bit ago, like this week. So I am excited to see all the pretty cards and layouts on the blog hop. Looking forward to playing with my order when it comes…. The Build a Flower sets are beautiful. The gardenia is my favorite! Your card is lovely!! I love the Build a Flower series, they are irresistible. Love the build-a-flower stamp sets! They look so real with all the layers. An they are great for coloring with markers or watercolor. Gorgeous flowers set. Will try them with water color marker. Thanks for the giveaway chance. Beautiful cards! Love the build a flower series! Love the build a flower sets ! Gorgeous cards. Thank you, Altenew for sponsoring this terrific blog hop. Your designers have done you proud with all their wonderful designs and inspiration. And thanks for the chance to win some prizes! I love yours sets my favorite is the Rose and I know it’s not new but it is hard to choose love them all. I have never seen such detail WOW! I love all kinds of flowers but love the Build-A-Flower Gardenia & the Anemone! They both are so gorgeous & have so many options for decorating with them! Love all the build-a-flower stamp sets and dies. Love these stamp sets, absolutely stunning as always, Well done Altenew on another great release!